A lot of content marketing efforts suffer from, what I would call, a lack of balance. They entirely focus on one side, or float a little in between. To get out of your content marketing budget what’s in it, you should start by asking yourself what you want to accomplish. Here’s one possible answer: Build a connection with people as a brand to get them into the funnel. Let’s look at the elements of this definition one by one. I come from the world of advertising. My contribution to discussions about content marketing is often based on brand strategy: the link between content and brand. Strongly put: every piece of content must be a building block for your brand. That is often missing. Many companies produce blog articles and videos without a clear plan, without coherence, without any kind of relationship with the sender. Interesting perhaps, but they could just as well come from someone else. Or they never stop to wonder if their story is worth telling. Here’s the risk when advertising people like me have a say in the matter: excessive focus on brand strategy can result in the kind of ad-like content that no reader or viewer will ever warm to. Instead, you build a brand by being helpful and always providing something valuable: engaging information, an answer to questions that people have, entertainment. In this respect, marketers can learn a thing or two from journalists. 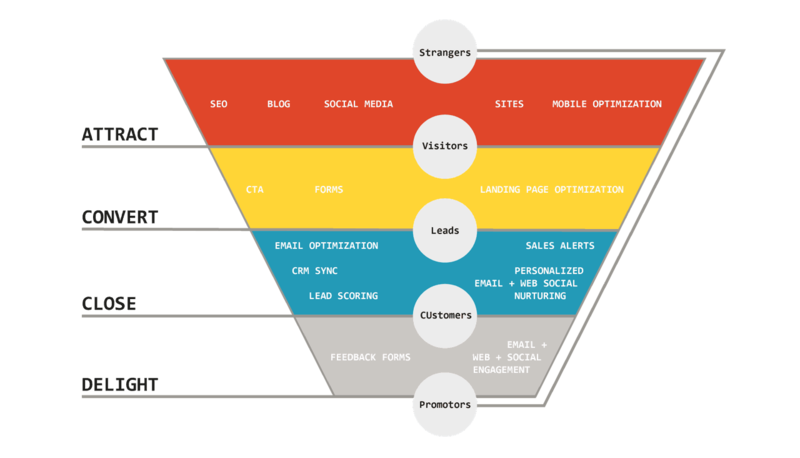 Conversion is the common goal of content and marketing, and the way it works is through the funnel: an imaginary funnel that leads people step by step from visitor to buyer. Properly balanced, content is not only interesting enough to read and share, but also results in action. And every action that the reader takes in response to the content must offer us something in return: a new (email) address for our newsletter, data that allows a further audience segmentation, information about the appreciation of a particular item, or other data that can help us reach and attract more potential customers. Content creators with an editorial background tend to forget about this. Their colleagues from the marketing world, on the other hand, tend to push too much. Ideally, you start by setting up a strategy (for marketing people) or a format (for the journalists among us), which will fit all your communication. And then you serve your content piece by piece, with each separate blog post or other publication taking the prospect a step further on his customer journey. Content marketing and storytelling are relatively new concepts, but of course they do not come out of thin air. In the past, I have been actively engaged in non-profit marketing: fundraising for charities. An area that is at least as competitive as the business world. That was before the internet was much of anything. Our main source was direct mail – in the good old mailbox. But what we did was pure content marketing. A lot of storytelling, reducing world problems to recognizable individual people, with a face, a name and a life story. A well thought-out funnel, aimed at changing cold addresses into hot addresses. And once prospects were donors, they regularly received a special ‘feel good’ offer to donate for a beautiful project. Obviously provided with a call to action not to be missed in the form of an attached payment slip. Content marketing is not new, not contradictory and not even difficult. It is all about finding the right balance.